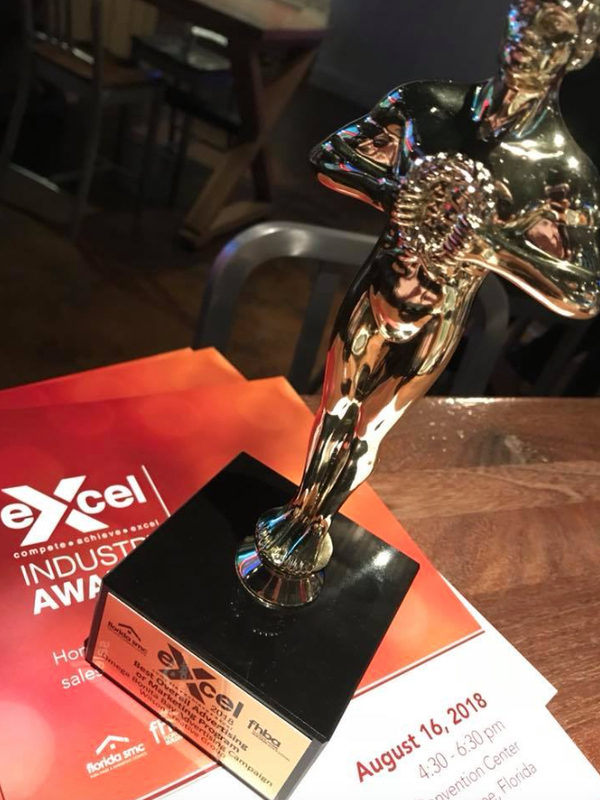 Wilson Creative Group (WCG) won the Excel Award for Best Overall Marketing or Advertising Program for the Omega project, a luxury high-rise residential tower in the prestigious Bonita Bay community. Omega is a 26-floor glass edifice with light filled residences featuring large, open living spaces that offer picturesque views of Estero Bay and the Gulf of Mexico. WCG was tasked with launching an advertising campaign to inform target audiences of the new tower opportunity, create a buzz, and generate sales. The full service agency accomplished just that, as reservations worth nearly $80 million have been processed since the project was announced in January 2018. The Omega campaign included a bold logo, digital banner ads, newspaper and luxury lifestyle magazine print ads, social media campaigns, TV spots, dynamic website design, direct mail brochures, and more. The Ronto Group developed Omega; their other luxury living communities Naples Square and Seaglass at Bonita Bay, are also WCG clients. This win represents the fourth time in the past five years WCG has earned the top marketing award for overall advertising campaigns, having previously won for John R. Wood Properties in 2014, Seaglass at Bonita Bay in 2015, and AQUA at Pelican Isle in 2017. “The WCG team worked diligently on Omega’s campaign, for this work to be recognized by our peers truly makes us proud. It’s the one award to win in my humble opinion, and we’re honored to have won this so frequently in recent years!” says President and CEO of WCG, Peggy Wilson. Sponsored by the Florida Home Builders Association (FHBA), the Southeastern Building Council (SEBC), Excel Awards honor excellence in the construction and related industries, specifically those builders, commercial contractors, craftsman, Realtors®, on-site salespeople, public relations professionals, associate/supplier, media and advertising professionals who make major contributions to the residential home building and commercial construction industry through superior, innovative and creative sales and marketing. The Southeast region covers: Arkansas, Alabama, Florida, Georgia, Kentucky, Louisiana, Mississippi, North and South Carolina, Tennessee, Texas and Virginia. Founded in 2007, Wilson Creative Group is an award-winning, full-service advertising and marketing firm assisting businesses in the development of successful brand and advertising strategies. WCG offices are located at 2343 Vanderbilt Beach Road, Suite 608 in Naples. For more information, call 239-597-9480 or visit www.wcgpros.com.